I fell in love with Bali the moment I first saw it. The sensuous sandalwood smoke curling itself upward to mingle with my breath and remind me to be fully in the moment, the smiling happy people who wanted to know everything about me, the colorful flowers everywhere. It was the first place that I traveled to that felt completely exotic. 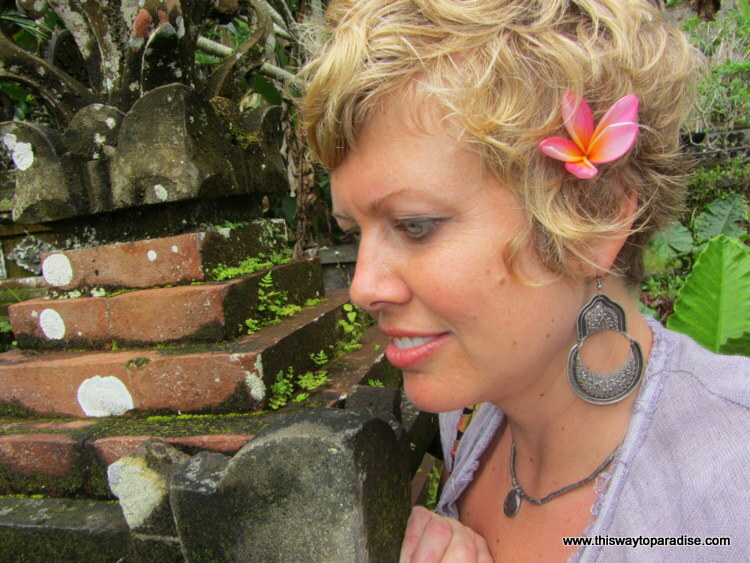 There were so many things to do in Bali, and I fluttered around from place to place trying to do them all. But seven years later, I still felt like I needed to go back. I had done all the touristy things, but Bali was still calling to me. Bali still wanted to be known by me. So I went back. Seven years later. Yes, there were more tourists, more traffic, and it was no longer the sleepy little place I had discovered years before, but you know what? I was still in love. 1. Take a Sunrise Offering Walk– Early in the morning take a walk with no destination in mind. Look at the beautiful offerings that are put out. Look at the flowers adorning the statues. Say hello to the shopkeepers sweeping the sidewalk. (The Balinese love their sweeping). Walk through The rice fields. Watch the chickens. This is the real Bali. Plus, it will be the one time you can take a walk without being asked if you would like a taxi! 2. Sit Down With The Taxi Drivers-I found myself getting annoyed with all the taxi drivers constantly asking me if I needed a ride. So one day I decided to talk to them. I sat down and watched the traffic go by with them, and decided to ask them if they knew of a class where I could learn painting. They were sitting in front of a sign that offered painting classes. You never know what can happen when you try to understand the things that annoy you. Plus, all those taxi drivers make getting around in Bali pretty easy. 3. Take A Painting Class-I discovered that I loved painting by taking a painting class in Bali. Ubud, especially, is full of artists, and many of them offer classes to teach you what they know. Taking a painting class was one of my favorite moments in Bali. The best place for a painting class is in Ubud. Not only are the Ubud travel costs very reasonable, it’s the place to visit if you are looking for art. 4. Visit A Healer– OK, I know that this is a bit Eat, Pray, Love, but there are some genuinely amazing healers that changed my life in Bali. Most of these were in Ubud, but I had both physical and emotional ailments healed that were affecting my life, and this was the top thing that I am glad I did while I was in Bali. 5. 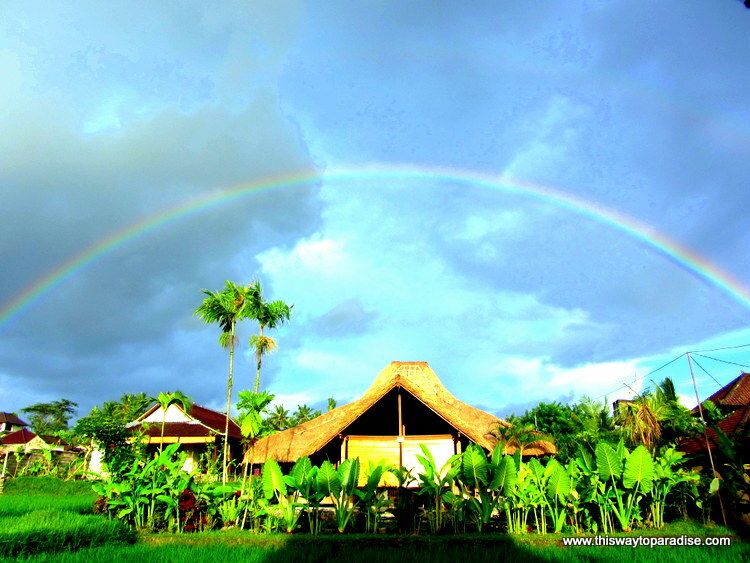 Take An Ecstatic Dance Class At Yoga Barn-Yoga Barn is also in Ubud. They offer amazing ecstatic dance classes on Friday nights and Sunday mornings. Seriously, I’ve been away from Ubud for four months but I still wake up Sunday mornings thinking of that class and wishing that I was going to that celebration of life and movement. And if stillness is what you’re looking for, don’t miss the Sound Meditation or the Tibetan singing bowl classes. 6. 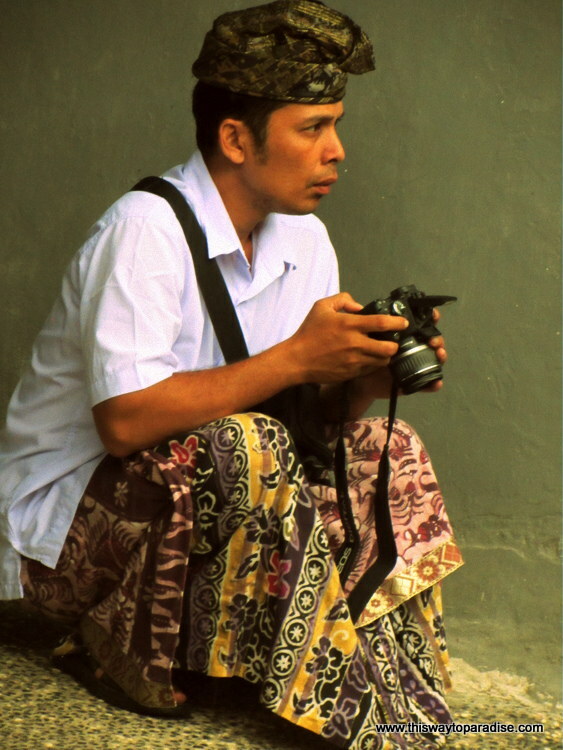 Go on a photo walk or just sit and photograph what comes to you.– Seriously, there is always something interesting to photograph in Bali. Even the locals who have spent their whole lives there find new things to take pictures of. Bali is a photographer’s wonderland. 7. Clean Up Trash On The Beach– Yes, it’s sad and true. The beach in Kuta has a lot of trash on it. Start a cleanup party and start cleaning up the trash. I bet other’s will join you, and I bet the touts won’t bother you! 8. Get Some Sewing Done– By The Time I Reached Bali, my clothes were very much in need of some mending. But, these tailors are very talented and do much more than just mending. In fact, many of the clothes you find in stores are sewn in Indonesia. Give a local some work and yourself a new outfit and have them make you some new clothes. 9. Drink a cold coconut.- There is nothing more refreshing than drinking a cold green coconut and watching the world go by. Bali is hot and a coconut really does refresh and hydrate you like nothing else. 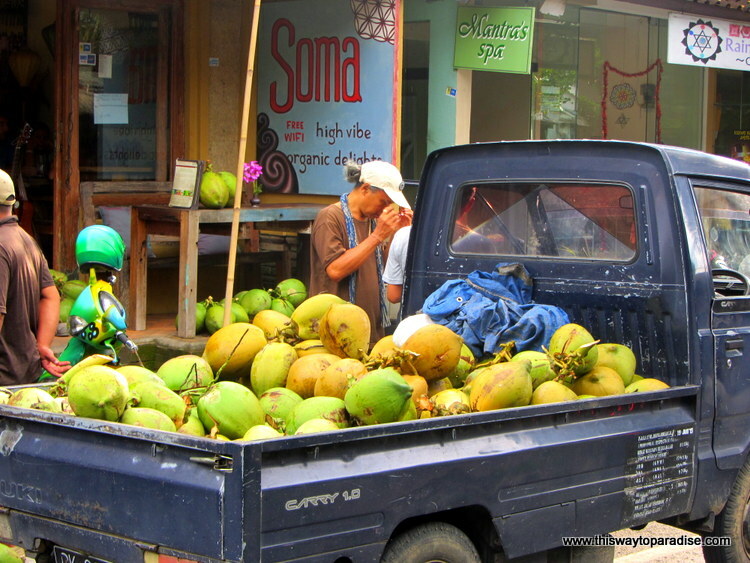 My favorite coconut spot in Ubud was Soma. It was a fun spot to watch the world go by, plus they never seem to run out. 10. 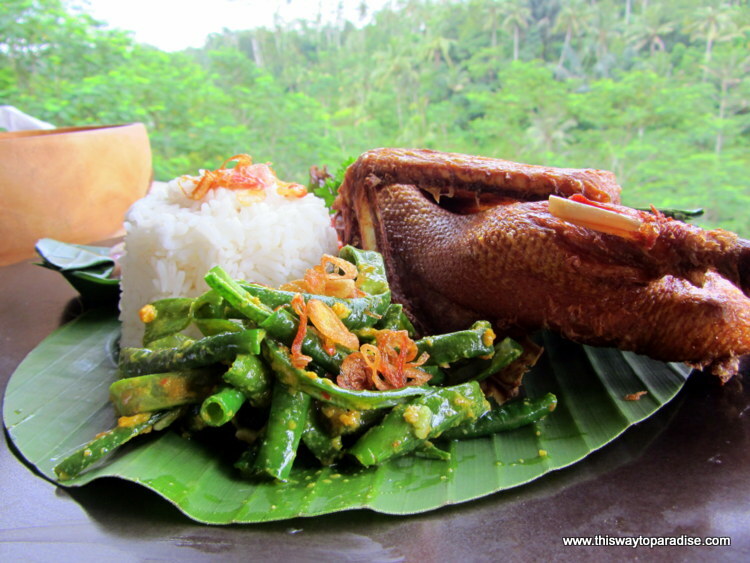 Eat– Indonesia has some of the best food I’ve ever eaten. One of my favorites is the bebek bengil or crispy duck, but I also loved the suckling pig. There are also a lot of healthy restaurants that don’t necessarily specialize in Indonesian food, but offer vegetarians and even meat eaters delicious and nutritious meals. Many places in Bali also offer fresh juices and smoothies. Alchemy and Clear Cafe were my two favorites. 11. Watch The Rice Grow.- Bali is the one spot on this earth that taught me to just be. My first four nights were in a heavenly place in the middle of a rice field. All I seriously wanted to do was watch the rice grow. Whenever I am needing some peace in my life, I think back to those four days, and that rice field, and I remember to breathe and just slow down. And then I smile. And if you want to catch up with work in Bali, take a free trial of cloud based Windows Desktop from CloudDesktopOnline.com and SharePoint portal from CloudAppsPortal.com . Great list and beautiful photos! The food looks and sounds delicious. Great list! I have yet to go to Bali because I’ve heard how commercial it has become, yet something keeps telling me to go anyway. I’ll definitely keep this list in mind when I do venture that way. It sounds like Bali is your sanctuary! I have heard others say similar things and get the feeling that It is a haven for yogis and creatives. It seems to have something to offer for everyone from spiritual seekers to conservations to GAP year students exploring the world for the first time. What a great list of things to do in Bali, I especially love #11. I could sit and watch the rice grow all day long, it doesn’t get more peaceful than that! What a lovely, refreshing post. Great article, Sara!! I absolutely love Bali! Yeah, I couldn’t stop taking photos. So many good opportunities! Valen, thanks for this!!! I haven’t done much reading or talking to people about Bali (sooooo many people I know have been there) and I love your non-touristy suggestions!!! I’ll be a bit far from Ubud but I am hoping to get there. (staying in Bingen). I’ll be on my own the first week and with a group the second, painting!! I’m looking forward to falling in love! This is great! Can you give me a recommendation for a healer? Click on the link above where it says visit a healer. 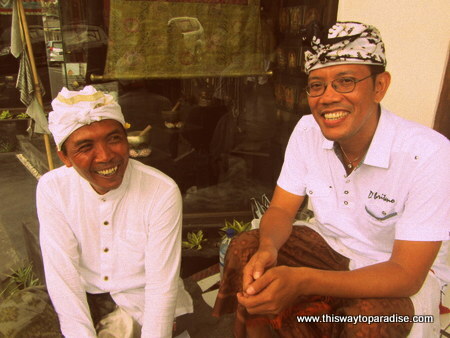 Nice post… Thank you for visiting Bali and learning our culture and life stlye of Balinese people. Best regards to you, too!